At Opus, we state our mission in terms of our clients' goals because they are at the center of everything we do. It's not just what we do, it's who we are. Read below to see just some examples of our mission at work. In 2014, when we completed an addition to Chicago Tube & Iron's Eagan, Minn. facility, the company celebrated its centennial and its 100th straight year of profitability. Key to both accomplishments was a focus on spending money prudently. Typical of complex projects, this expansion wasn't without its challenges. Embracing and dealing with these challenges allowed us to exceed Chicago Tube & Iron's expectations. Early on, we faced one of the large challenges—a future highway expansion's easement requirements would have left too little room on the site. We reacted quickly and proactively developed a plan, designing a new layout that fit within the upcoming easement changes. The solution met the municipality's future easement requirements and CTI's need for more functional square footage. The Opus Design Build team enabled us to exceed expectations in all aspects of the project and also stay on budget. Every organization has a purpose and goals, and a thoughtfully designed and well-constructed facility plays a critical role in supporting those goals. AMC's goal is to be one of the world's premiere entertainment companies. As a major movie theatre chain, their headquarters had unique requirements to support its purpose and mission, including a test kitchen to create innovative menu items and seating areas with large flat screen TVs to view movies and promos to capture real-time movie-goers insights. While empowering its mission, AMC's new headquarters is supporting the organizational culture and values that will help them achieve that mission. We really wanted people to interact and get to know each other... the project was extremely successful, and AMC associates engaged with the space immediately. Everyone is just thrilled that it allows for interaction and intuitive collaboration, while also just being cool. Unique business needs can be addressed with a unique facility design. The Gavilon Group needed a large trading floor to supports its commodities trading business. Not only did we deliver a viable solution for them, but the trading floor effectively integrates with the rest of the building allowing it to accommodate multiple tenants in the future if Gavilon doesn't renew its lease. This forward-thinking approach allows us to address business needs now—and into the future. Opus was the best partner we could have chosen to work with... the entire Opus team focused on delivering the highest quality and most efficient product to satisfy our company's needs. In the end, Opus exceeded our expectations—not our budget or timeline. In today's fast-moving service industry, operating efficiently is crucial. To enable its employees to operate at the highest levels, Houston-based CenterPoint Energy chose us to design and construct a new office and warehouse facility in Golden Valley, Minn. With this optimized building, we're supporting their vision to "Lead the nation in delivering energy, service and value." CenterPoint Energy is looking forward to enhancing our operational efficiencies in our Golden Valley Service Center. Our new facility will allow us to add value through superior customer service capabilities, new technologies and innovation. With careers growing in science, technology, engineering and math (STEM) industries, many educators are providing high-quality STEM education and enrichment to students. When Visitation decided to increase functionality of their entire campus and create a dedicated STEM education area to support their education mission and current initiatives (including an award-winning robotics team), they turned to our expertise to handle the complexities of their building. We believe that the Visitation Heart and Mind project has created the kinds of learning environments that we need to prepare our students for 21st century success. Bringing the Visitation Heart and Mind project in on time and on budget was no small feat and was hugely appreciated. [Opus] respected that our mission is education, and were masterful in not having construction interfere with it. We loved working with Opus. Efficient logistics and distribution is vital to ConAgra's mission of "making the food you love." When ConAgra needed to consolidate multiple Midwest distribution facilities into one centralized location in Frankfort, Ind., they turned to our team and the nearly 30-year shared history. With a keen understanding of ConAgra Foods' business model and specific needs, our design-build process enabled completion of the immense build-to-suit project in an expedited timeline—just 52 weeks and six weeks ahead of schedule. Our mission to make food that people love is important to ConAgra Foods in many ways. The distribution center in Frankfort allows us to stay cost competitive and distribute food at a price that people can afford. When Xcel Energy wanted to expand its downtown Minneapolis campus in order to bring together employees from separate offices and create workforce efficiencies, they chose us, a team with deep experience in corporate campus and urban development and construction. With their sights set on company growth, Freightquote—the nation's largest online shipping broker—began searching for a design-build firm that could meet their non-negotiable move-in deadline for a new headquarters office and main call center. Although others in the commercial real estate industry claimed meeting the deadline was impossible, our team embraced their timeline and budget. While working closely with Freightquote, our team's deep office expertise and unique construction approach allowed us to develop a new state-of-the-art office space that would meet the company's growing business needs—and the vision of Freightquote's president, Tim Barton. Opus was able to commit to our rigid deadline when no one else could. 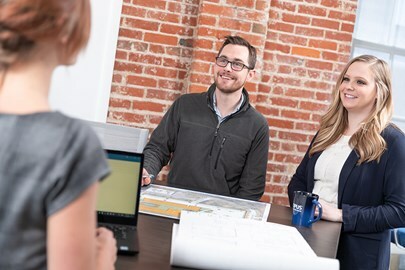 Their integrated approach allowed them to fast-track the project so we could move into our new 200,000-square-foot headquarters in nine months. With a growing student population and increasing demand for on-campus housing, Iowa State University chose our design-build team to deliver its first new residence hall in more than a decade on its Ames, Iowa, campus. With strong business at MC Machinery Systems Inc., the company's workforce was expanding and on the brink of outgrowing their facility in suburban Illinois. With an eye to the future, MC Machinery turned to us for a new facility to meet the specific needs of their business operations and provide a better customer experience. The new facility will allow MC Machinery to further expand its capabilities and service a diverse range of industries, including automotive, aerospace, energy, medical, military/defense, agriculture and more. Our main motivator to build a new headquarters was our employees and customers. We wanted to provide them a new state-of-the-art place to come to work to everyday with updated technological resources that enable us to better serve our customers. We are beyond pleased with how Opus made this vision a reality. With a facility built in 1901, Ascension Church wanted to update their worship and education spaces to make them more efficient and appealing to its congregation, students, staff and faculty. They chose our experienced Client Direct Services team for this important work. We began work on two overlapping phases in January 2016 and finished that November. Along the way, we treated the buildings as if they were our own, respecting their importance and Ascension's needs and operations throughout the project. For us, committing to Ascension's project meant fully committing to their mission and goals. Opus has an understanding of and a shared commitment to our mission and the people we serve. It really comes out of a sense of charity and justice. And oftentimes we don't think of businesses as living those values. But in our setting I saw Opus live those values. They were committed to meeting the deadline which for us was really important. I mean it was teachers back in the building without a day to spare. They made it. They didn't bring any of the stress of making that all happen to me. They were kind. They were responsive. They didn't get tired of my asking questions. They didn't get tired of explaining things to me. They did it with graciousness all the way through. I said to them, "You've now shared your gifts with our mission. You may see it as a building that you fixed. But now you're part of us and part of our mission." With continuing expansion on the horizon, the American Academy of Pediatrics (AAP) chose us to build their new headquarters in suburban Chicago. The five-story building is customized to their needs, including general work space for employees and areas for hosting industry conferences and events. AAP's new headquarters will support the organization's plans going forward. Our vision for this project has always been quite simple: to create a place that enables our child health mission. This new headquarters is designed to support the work of our staff and our 66,000 members at the highest level. Our new headquarters is more than just an office building. It is designed to be the new home for the profession of pediatrics and through state-of-the-art surroundings and communications. It is where we can pursue the AAP's mission together. Karen Remley, M.D., M.B.A., M.P.H., FAAP. We are Driven to Deliver® for you. We'd love to learn how we can empower your organization's mission with our real estate development and/or design-build construction services. We look forward to hearing from you.